This is a 100% honest, 100% authentic Fitbit Ionic review. Dadtography editors purchased this product with our own money. We were not compensated in any way for this post. Note: All images are unedited originals taken by Dadtographer Daniel. Please don't use our photos without permission. 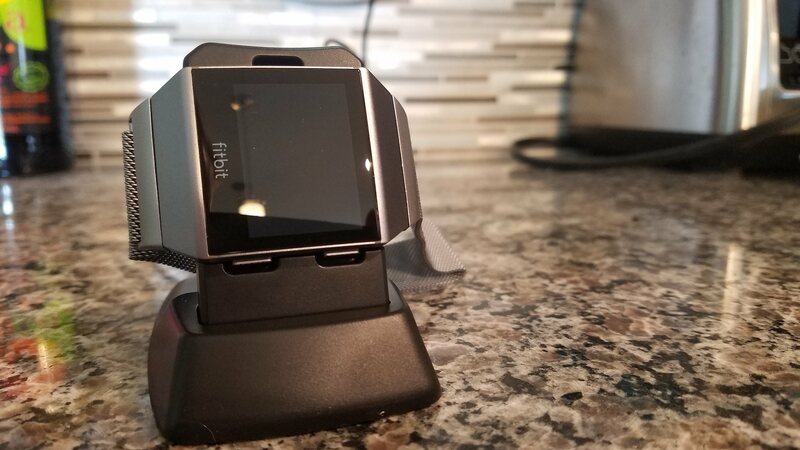 The Fitbit Ionic depicted on this post is shown with an optional charging stand that is not included with the original product. I do not consider myself to be an early adopter when it comes to most tech, especially wearables and smart watches. When I saw the Fitbit Ionic advertised, I had to try it, though. I ordered my Fitbit Ionic in early October from Amazon and started wearing it well before Thanksgiving. Now, over a month into my testing, I'm ready to write this review. If you received a Fitbit Ionic for the holidays, be sure to read this review before you open the box! The Fitbit Ionic smartwatch is a good product, but it has a few flaws. Can it compete with the Apple Watch 3? An overview of the Fitbit Ionic. Learn more Fitbit's entry into the smartwatch category. Is the Fitbit Ionic comfortable? Learn more about our thoughts on the Fitbit Ionic's comfort. How is the Fitbit Ionic design? Learn more about the design, materials and finish of the Fitbit Ionic. What are the Fitbit Ionic specs? Learn more about the full specifications of the Fitbit Ionic. Is the Ionic easy to use? Read our thoughts on ease of using the Fitbit Ionic. Common questions about the Ionic. Here are a few common questions about the Fitbit Ionic. See a few of our first images of our new Fitbit Ionic smartwatch. Why did Fitbit release the Ionic smartwatch? The wearables market is hot right now, and that especially goes for the smartwatch segment. The "latest and greatest" wrist gadget on the market gets a lot of attention, and therefore, customers. But with so many other smartwatch competitors out there, why would Fitbit release its own Ionic smartwatch considerably later than other brands, such as Apple? The fact is that the market continues to grow, with no end in sight for consumers' hunger for a great looking, functional smart watch. Fitbit positions the Ionic watch as less "smart" and more "fitness", trying to distinguish it a bit from front-runner Apple, no doubt. Fitbit has been known for fitness minded wearables that don't necessarily try to be everything to everyone. That's often the shortcoming of most other smartwatches in the market - the commercials depict them to offer next-gen functionality and interfaces, and those high expectations are hard to match in reality. I think Fitbit is a bit more honest up-front with the capabilities of the Ionic watch. How is the design of the Fitbit Ionic? When it comes to a new smartwatch, one of the first things you'll notice is the product's design. Design and materials are important in all watches - from a Rolex to a Timex. How the watch looks and feels can make or break your experience wearing it. Overall, I think the look and feel of the Ionic is good, but not ground-breaking. Again, I think Fitbit comes by this somewhat honestly. It's not trying to be an Apple Watch. It's not trying to be the shiniest watch on the shelf, with the best, most expensive materials. It's a fitness product and is built to perform as such. The aluminum watch face is functional and stylish enough for most situations. The watch is still fairly unique, so I get a good number of questions about it. Most have exclaimed, "Oh, I didn't know Fitbit made a watch!" The fit and finish of the Fitbit Ionic is good, but it's not exactly a head-turner. Is the Fitbit Ionic easy to use? Here's where the Fitbit Ionic starts to struggle a bit in my opinion. I've owned one other Fitbit product in the past (a Charge HR) and had a pretty good experience with it. The Ionic runs on what Fitbit calls the FitbitOS - an operating system built specifically for this watch. The thing with operating systems is that they are really easy to mess up and get wrong. What one person finds intuitive and easy to use, another may find difficult. That may be the case with the FitbitOS in my case. I found the initial Bluetooth connection to my Android (Galaxy S7) device to be way more challenging than it should be. Apple iOS users may have a different (hopefully easier) experience. I also find the watch controls themselves to be not so simple to figure out. The watch has three buttons - one on the left and two on the right. The button on the left seems to open the default watch screen, although, it's not always responsive to button clicks. When in this mode, these act as "personal training" guides to help you with each of these workout types. You can use the button on the left side of the watch as a "back" button when in this mode. One more swipe (the last one, by default) and you'll see a Starbucks app. I don't care for the watch controls. Unresponsive buttons combined with watch face swipes make for a clunky experience. Is the Fitbit Ionic comfortable to wear? I didn't care for the standard "elastomer" bands. My skin reacted to them once I started to sweat beneath the band and I had to get replacements. I opted for magnetic stainless steel bands (Amazon affiliate) that have turned out to be much better, and in my opinion, more stylish as well. The bands are exceptionally easy to swap out. There are buttons on each side of the band where it connects to the aluminum watch face. Push those buttons down and the band will detach. The standard bands that came with the Ionic didn't cut it for me. I swapped them out with stainless steel. How are the fitness tracking features on the Fitbit Ionic? As mentioned above, there are a number of areas of the Fitbit Ionic that are focused on fitness activities. The "personal training" features are really quite good - especially for novice athletes, such as myself. They are there to help motivate you, keep you on track and guide your workout a bit as well. I especially enjoyed using the interval training timer and treadmill workout guide. The interval timer helps you set and stick to specific intervals of workout and rest. Fitbit will have you move (exercise) for 30 seconds, followed by 10 seconds of rest. You'll repeat this as guided by the tracker. The treadmill feature (like others) shows your time, total steps, average heart rate (bpm) and max heart rate (bpm). While actual personal trainers may not find it as useful, novice "athletes" will likely enjoy the guidance provided by the Ionic. Battery life lasts up to 5 days with a GPS battery life up to 10 hours. We recommend charging your Fitbit Ionic every few days to ensure you are always tracking. Battery life and charge cycles vary with use & other factors; actual results will vary. Fitbit Ionic is water-resistant up to 50 meters and is sweat, rain and splash-proof. With any wearable device, it’s best for your skin if the band stays dry and clean. The wristband is made of a flexible, durable elastomer material similar to that used in many sports watches & the buckle is made from surgical-grade stainless steel. Fitbit Ionic syncs automatically and wirelessly to computers and 200+ leading iOS, Android & Windows devices using Bluetooth 4.0 wireless technology. Q: What is the watch face on the Ionic made of? A: The Fitbit Ionic watch face is made of Corning Gorilla Glass 3. Q: What is the Ionic watch buckle made of? A: The Fitbit Ionic watch is made of surgical-grade stainless steel. It will dent or scratch if dropped or bumped. Q: What are the Fitbit Ionic bands made of? A: The standard bands on the Fitbit Ionic are made of an elastomer (rubber) material. Bands can easily be swapped out on the Ionic. 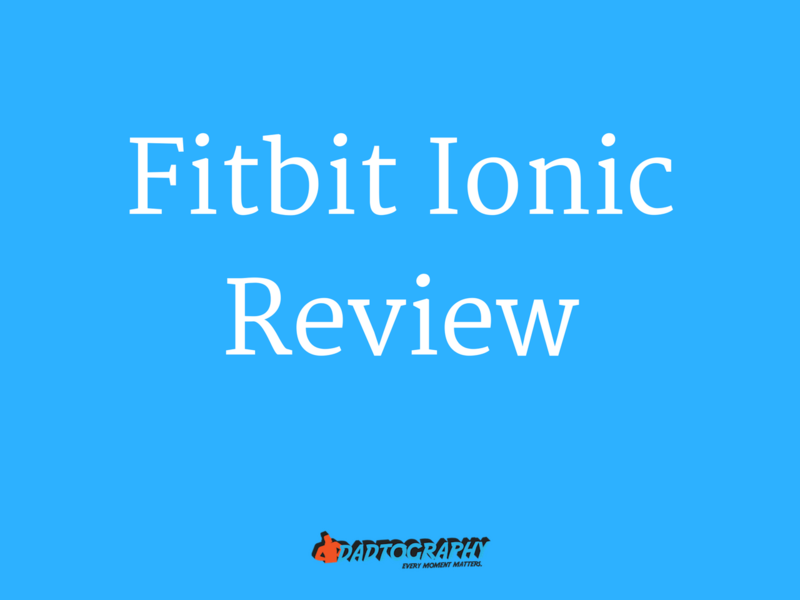 Q: How accurate is the heart rate monitor on the Ionic? A: The Fitbit Ionic has an optical heart rate sensor. The accuracy depends upon the application. If you're active and moving around, heart rate tracking may not be perfect. Overall, and without testing, I found the heart rate monitoring to be fairly reliable. Q: Is the Ionic better than an Apple Watch? A: It's difficult to compare the two watches, since they really don't serve the same purpose. I don't consider the Ionic a full-on smartwatch, but as a watch / fitness tracker, it does a good job. Q: What colors does the Fitbit Ionic come in? Q: How accurate is the Ionic sleep tracker? What do you think? Do you have the Fitbit Ionic smartwatch, too? What do you think of it? Leave a comment below!